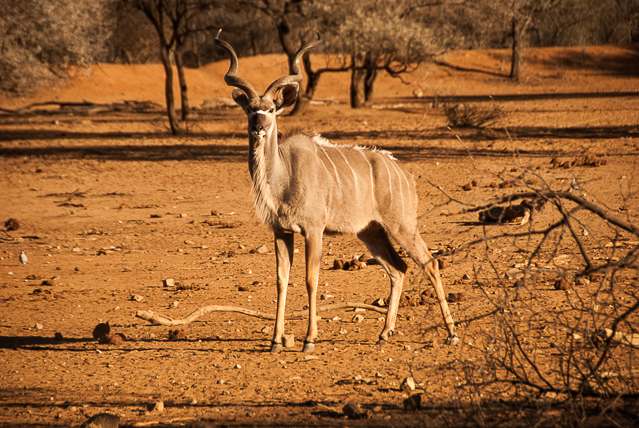 There are so many wonderful places to experience in Namibia, but a wildlife safari should be on the very top on your list. 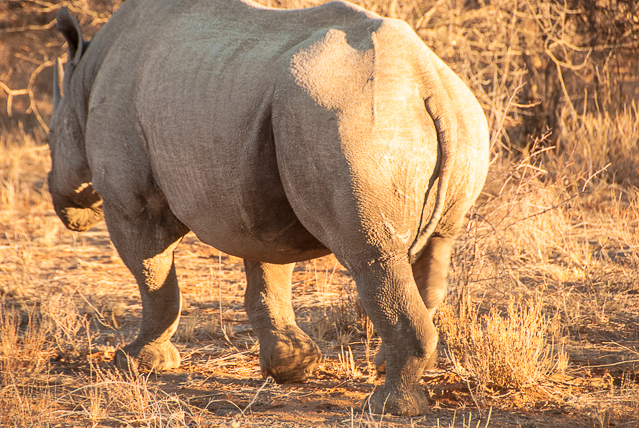 The Erindi Private Game Reserve is an amazingly beautiful 174,000 acre fenced park where conservation and sustainability are their biggest assets. 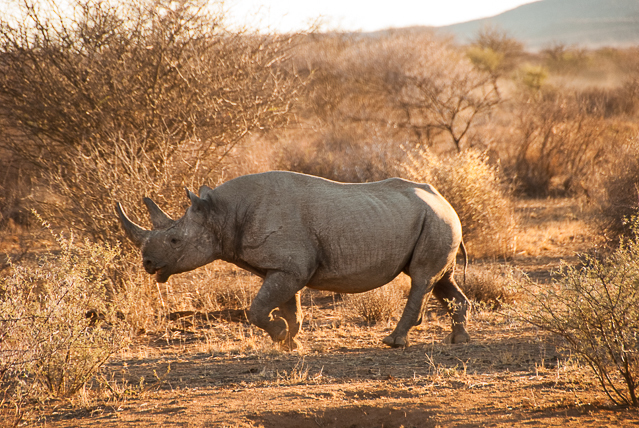 Rogue bull elephants and lions that would otherwise create problems for local farmers are relocated to this reserve to roam free, and Erindi has the largest number of black rhinos in Africa — protected from poachers who have nearly wiped them out in other nearby countries. 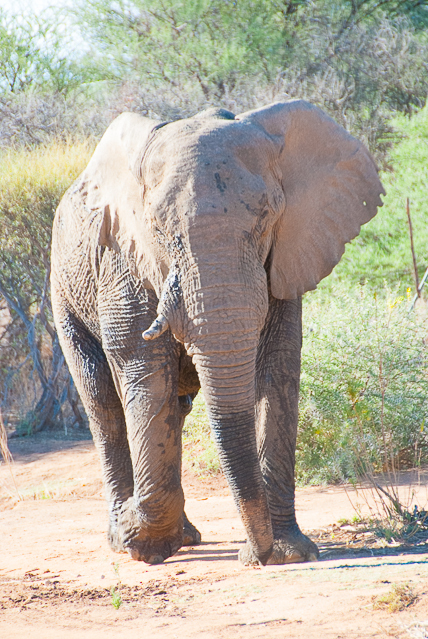 On our first day, we had the thrilling experience to see a bull elephant feeding on the local flora; and a black rhino eyeing us suspiciously as we invaded his space. Thankfully the jeep maneuvers this terrain easily, and in safety and comfort. 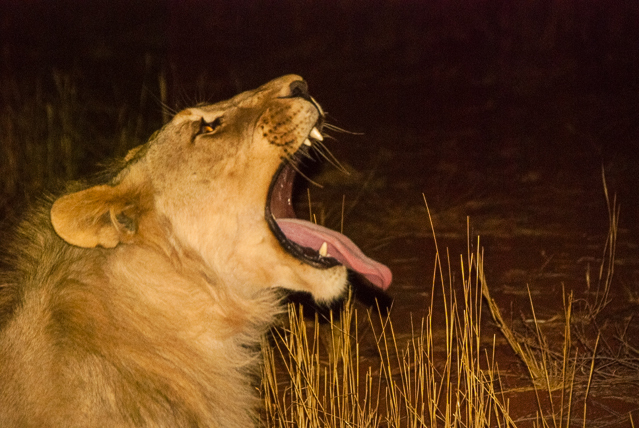 The Old Traders lodge is situated on a bluff overlooking one of the many watering holes where baboons, giraffe, elan, kudo, wart hogs and all kinds of birds come to cool off and drink. Another watering hole on the side of the lodge is filled with crocodile, hippos and the occasional rhino. 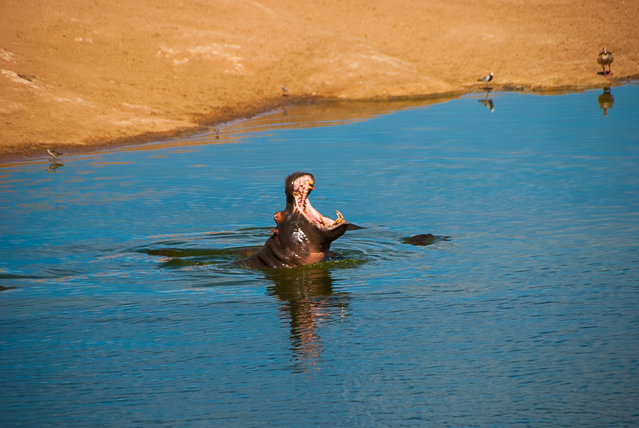 It was fascinating watching the hippos jostle, and the crocodiles test the waters near the newborn hippo. 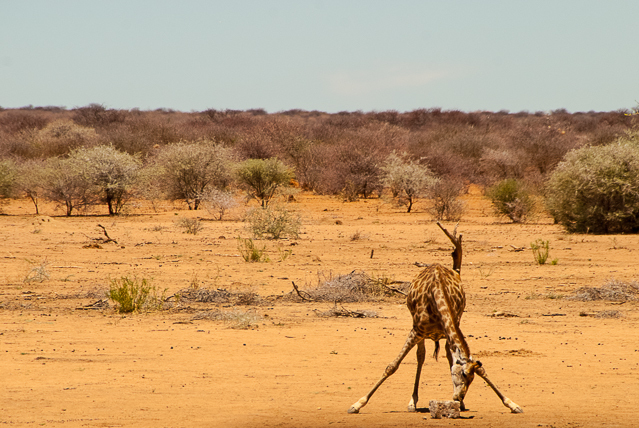 The best part is that you can enjoy this wildlife scenery while enjoying a delicious lunch or dinner – but it does make it difficult to put your camera down. 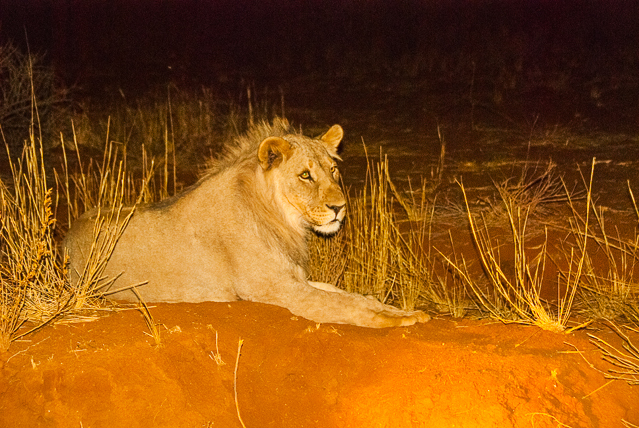 The individual chalets are also perfectly situated near the watering holes for round the clock viewing. The luxury suites are quite spacious and they all have their private veranda. 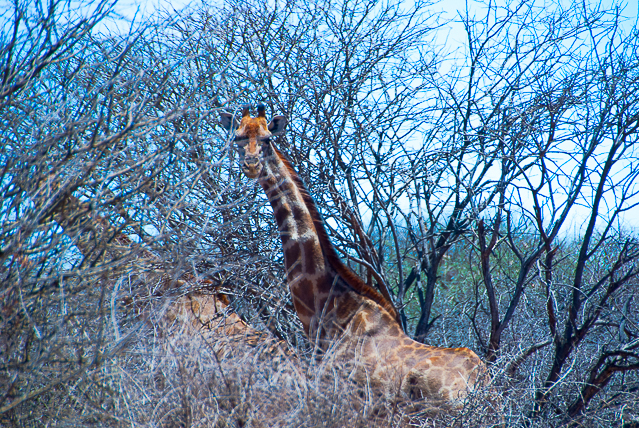 There is opportunity to participate in several “game drives” each day, and you will marvel at how close you are to the wildlife, sometimes less than five feet away. Every night we drove to a beautiful bluff overlooking exotic geography, for delicious “sundowner” food and drink, and of course fantastic photographic opportunities of the scenery. 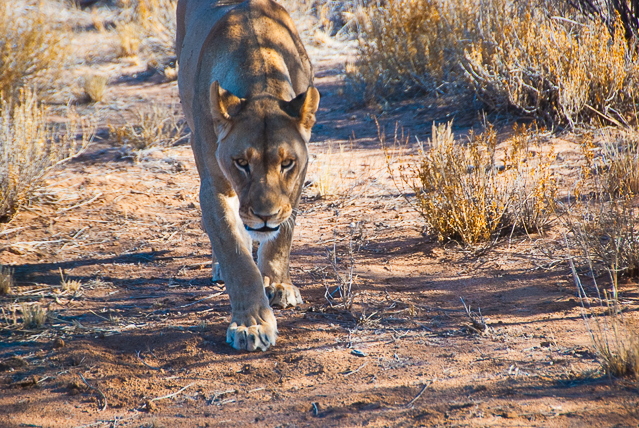 I highly recommend this beautiful reserve for an African experience you’ll never forget. All opinions and recommendations are our own. 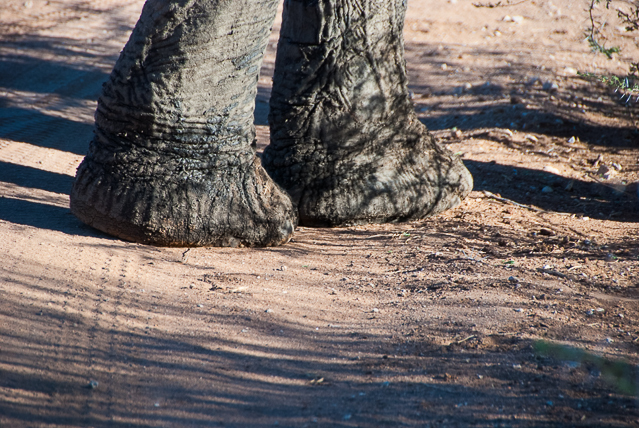 If you want to be entertained by some videos during our travels in Namibia, click on YouTube Global Adventuress to watch baby elephants in the Huab or the staff at Kulala Desert Lodge welcome guests.